Your Frisco home is your castle, and it’s also a big investment. With that in mind, you want to make sure you can see and enjoy it all day long. While it’s easy to come home in the dark after work and turn on the lights inside, it may not be so easy to light up the outdoors. Fortunately, the right outdoor landscape lighting can help change all that. Low voltage lighting options are popular with a lot of homeowners because they don’t cost much to operate. They also stay cool to the touch, so you can put them near plants and flowers without damaging anything. That lets you tuck your landscape lighting into your flower beds or in other out of the way places that work well for your yard design. Fortunately, the right outdoor landscape lighting can help change that. Low voltage lighting options are popular with a lot of homeowners because they don’t cost much to operate. They also stay cool to the touch, so you can put them near plants and flowers without damaging them. That lets you tuck your landscape lighting into your flower beds or in other out of the way places that work well for your yard design. Outdoor LED lighting is an excellent way to update your yard. Less modern options used filament bulbs which got hot, used a lot of electricity, and burned out rather quickly. Because of those problems, there were a lot of people who avoided landscape lighting or just didn’t use as much of it as they would have liked to because of the cost, risk, and maintenance issues they faced. Fortunately, LED lighting options came along, and when coupled with low voltage choices they work very well to provide good quality lighting for a low cost and with very little maintenance. Having those types of lighting choices in your Frisco yard is a great way to update your outdoor space and have it looking beautiful. Fortunately, LED lighting options came along, and when coupled with low voltage choices they work very well to provide quality lighting for a low cost and with very little maintenance. Update your outdoor space with outdoor lighting by Creative Nightscapes. Frisco is a great location for people to live, work, and play. It’s close enough to Dallas to enjoy all that the bigger city has to offer, but yet it’s also a stand-alone city with a lot of great things to do. Toyota Stadium and Dr Pepper Ballpark are both there, so if you like sports you don’t have to travel far to watch a game. With so many people in the Frisco, TX area enjoying local and regional sports teams, along with national teams, it’s a great benefit to have such nice places to play and watch sports right there in the town. If sports aren’t your thing, there are plenty of other things you can get involved with or go and see. Frisco Heritage Museum is located there, along with Stonebriar Centre, and Arbor Hills Nature Preserve. The close proximity to the DFW International Airport and Dallas Love Field is convenient for Frisco residents. We're so pleased with the end result of our lighting. Our dark house was transformed by Jerry and his team. He completely understood our vision and more than delivered. The architectural details of our home stand out now and the house has the "wow" factor it was missing at night. Love the front so much we're going to entrust him to the back yard as well!! Thank you!! Jerry and Creative Nightscapes surpassed my expectations which are lofty to begin with. Jerry over-delivered on every commitment to the job and the final result absolutely transformed the house and the back yard. Creative Nightscapes deserves all of their positive reviews and the VALUE of the final result far surpasses the price. SERVICE is everything to me and you can’t put a price on that. Thank you Jerry and Creative Nightscapes. Loved the design, thouroughness, and attention to detail. Second time using your company, all because of George! George is a professional in every sense of the word. Listens to the customer and does his best to meet their needs! Professional installation with prompt service. Creative Night Scapes did an outstanding job installing outdoor LED lights in both my front and backyard. Exceptional Service and Best Price! After interviewing numerous outdoor lighting companies, I have to say George was the most professional and most reasonable in regards to pricing. I was impressed that he was very detailed minded with project, yet sensitive and receptive to our needs and budget. Creative nightscapes delivered and provided exceptional service, they were most efficient and the job performed exceeded our expectations. I would strongly recommend George and his crew. You will not be disappointed, you will get the best product and customer service in DFW without a doubt. Jerry's experience stood out in the design consultation and the crew did an excellent job with installing our lights. Our house has been transformed beyond our expectations. Jerry Holbrook, was great super honest I will for sure be doing business with them in the future. Added Kichler LED lighting to an existing system at home in Park Place Estates. Set path lights in landscape beds to illuminate the front walkway, steps and landscaping. Mounted down lights on arbor to highlight walkway and columns. Placed up lights to accent trees and landscape greenery. Designing new lighting system for home in Frisco. Facade up lighting and tree lighting throughout property. The trees have beautiful moonlighting to accent the landscape greenery, walkways and steps. The circle driveway is illuminated providing functional lighting for family and friends. Beautiful accent up lighting on home. Accent lighting on planters in courtyard area along with down lighting for seating areas. Beautiful accent lighting on home, wash lighting on planters in flower bed. Back yard up and moonlighting in trees illuminating seating area landscape beds and yard. Up lighting on decorative windmill. Removed existing fixtures from front of home and installed new Kichler LED outdoor landscape lighting at home in Christie Ranch. Mounted hardscapes under top of fence and under eaves to illuminate fence, gate, walkways, and garage doors. Placed up lights to accent facade of home, columns, peaks, entry way, and tree canopies. Mounted down lights in arbor to highlight the patio seating area and nearby walkway. Installed Kichler LED landscape lighting at home in Starwood. Placed up lights to accent Live Oak trees, Yaupon Holly trees, Magnolia trees, and Maple tree near the back patio. Mounted hardscape lights under the arbor highlighting the barbecue area. Installed Kichler LED outdoor lighting at home in Newman Village. Placed up lights to accent various trees in front and back yards. Installed Kichler LED outdoor lighting at home in Phillips Creek Ranch. Placed up lights to accent facade of home, various trees, and planter. Set path lights to highlight steps leading to front of home. 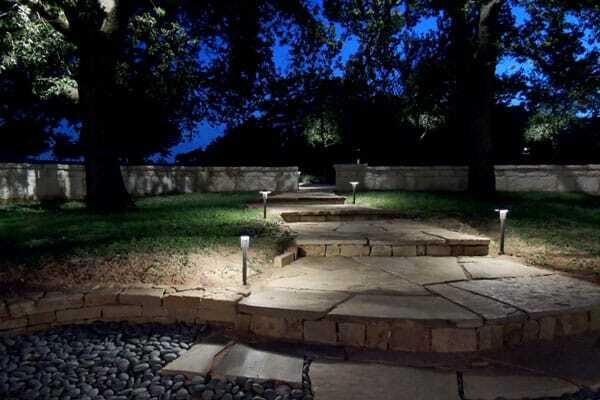 Mounted down lights and puck light to illuminate walkway near patio, Holly trees, and yard. Removed existing fixtures. Installed Kichler LED outdoor lighting at home in Cypress Creek. Placed up lights to accent facade, columns, address, peaks of home, Live Oak tree, and Crepe Myrtles. Mounted down lights to create moonlight effect and illuminate driveway, walkway, and landscape greenery. Installed Kichler LED outdoor lighting at home in Phillips Creek Ranch. Set path lights to highlight walkway to front entry. Placed up lights to accent trees in front and back yards. Mounted down lights under eave to illuminate landscape bed below. Installed Kichler LED outdoor lighting at home in Villages of Stonelake Estates. Place up lights to accent trees behind pool. Mounted down lights in eave to highlight side yards. Set path lights to illuminate walkway. Mounted hardscape lights under pergola to highlight patio below. Installed Kichler LED outdoor lighting at home in Prairie View. Placed up lights to accent facade of home, entry way, columns, peak. Installed Kichler LED outdoor landscape lighting at home in Stonebriar. Placed up lights in back yard to accent Crepe Myrtle trees, Hollys and Palm trees. Mounted down lights in eave to illuminate yard. Removed all high voltage facade lighting and low-voltage pathway lighting. Installed Kichler LED landscape lighting at home in Autumn Park. Placed up lights to accent the facade of home, columns, fountain, Crepe Myrtle, Oak tree, Rose Vine trellis, Yaupon tree, and Evergreen Junipers. Mounted down light in Oak too to highlight rock formation on back of pool. Installed Kichler LED lighting at home in Preston Estates. Placed up lights to accent tree canopies in the front and back yards. Mounted down lights to illuminate steps to pool, walkway, and chicken coop. Set wash lights to accent landscape greenery. Removed exisitng fixtures. Installed Kichler LED outdoor lighting at home in Stone Creek Village. Placed up lights to accent facade, peaks, and entry way columns. Installed Kichler LED landscape lighting at home in Phillips Creek Ranch. Placed up lights to accent facade of home, columns, dormers, address and flag. Mounted down lights in eaves to illuminate kids play area. Installed Kichler LED outdoor lighting at home in Stonebriar Country Club Estates. Placed up lights in front and back yards to accent facade of home, grand entry, bay windows, statue, Italian Cypress, Holly tree, landscape beds, ducks, and garden. Installed Kichler LED landscape lighting at The Chase at Stonebriar. Entrances & Park: Mounted down lights in trees to create moonlighting and illuminate walkways, gates, lawn, seating areas, street, and stone pathway. Place up lights to accent trees and boulders. Set path lights to highlight walkways, steps, and landscape greenery. Removed existing fixtures and installed Kichler LED outdoor lighting at home in Lakes on Legacy Drive. Placed up lights to accent Crepe Myrtle tree and canopies of Live Oak trees. Mounted down lights in Oak trees to create moonlight effect, illuminate yard, patio, walkways, steps, and landscape greenery. Removed existing lighting. Installed Kichler LED lighting at home in Park Place Estates. Mounted down lights under eaves above garage to illuminate driveway area. Set path lights in landscape bed to highlight walkway, steps, and landscape greenery. Placed up lights to accent facade of home, front entry columns, and trees. Removed all existing lighting. Installed Kichler LED landscape lighting at home in Starwood. Placed up lights to accent to the facade of home and canopies of Live Oak trees. Mounted down lights in Oak trees moonlighting yard, walkway, and steps. Installed Kichler LED outdoor lighting at home in Dominion at Panther Creek. Mounted Deck lights on walls to illuminate walkway and steps. Set path lights in landscape bed to highlight steps and landscape greenery. Place up lights to accent walls, peaks, front entry, and trees. Installed Kichler LED outdoor landscape lighting at home in Stonebriar Country Club Estates. Mounted down lights accenting driveway, yard, deck, and chaise lounge area. Set up-lights to accent front of home, Junipers along right side of fence line in back yard, and Vitex tree. Re-lamped halogen path lights in front and back yard with LED bulbs.